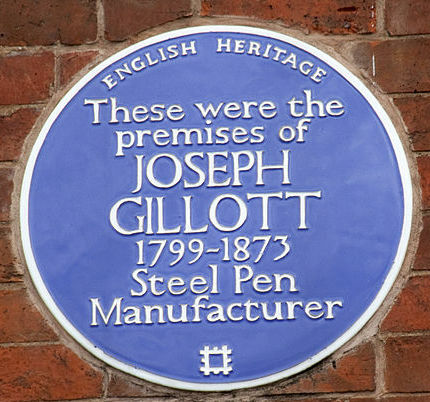 Joseph Gillott, steel pen maker and art patron. Commenced his working life as a cutler, soon becoming a 'noted hand' at forging and grinding knife blades. In 1821, no longer finding any work in his native place, he moved to Birmingham, where his employment was in the "light steel toy trade," the technical name for the manufacture of steel buckles, chains, and other works and ornaments of that kind. 1823 Joseph Gillott married Maria Mitchell, the sister of John and William Mitchell who were already manufacturing steel pens, and he was drawn into the trade. One of his chief troubles was the extreme hardness of the pens. This he obviated by cutting side slits in addition to the centre slit, which had been solely in use up to that period. To this was afterwards added the cross grinding of the points; and these two processes imparted an elasticity to the pen, making it in this respect nearly equal to a quill. For some years he kept his method of working secret, fashioning his pens with his own hand, assisted by a woman, his first pens being `blued' in a frying pan over a garret fire. At first he worked for others, selling his pens for a shilling each to a firm of stationers called Beilby and Knott. His business rapidly increased. It was at first established in Bread Street, Birmingham, then removed to Church Street, then to 59 Newhall Street, and finally to his great works in Graham Street, Newhall Hill, in 1859. The simplicity, accuracy, and readiness of the machinery employed enabled him to produce steel pens in large quantities, and as he sold them at high prices he rapidly made a fortune. He ultimately employed 450 persons, who produced upwards of five tons per week, and the price was reduced from one shilling each to 4 pence a gross. From his earliest years as an employer he spared no cost or pains to benefit his workpeople to the utmost of his power. His works afforded all convenience and comfort to the persons employed. He established a benevolent society among the workpeople, to which he subscribed liberally. He seldom changed his managers, and never had a dispute with his `hands'. 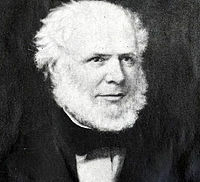 In 1872 Joseph Gillott died.